Any user with access to the map in a FREE Space can copy it to another Space. 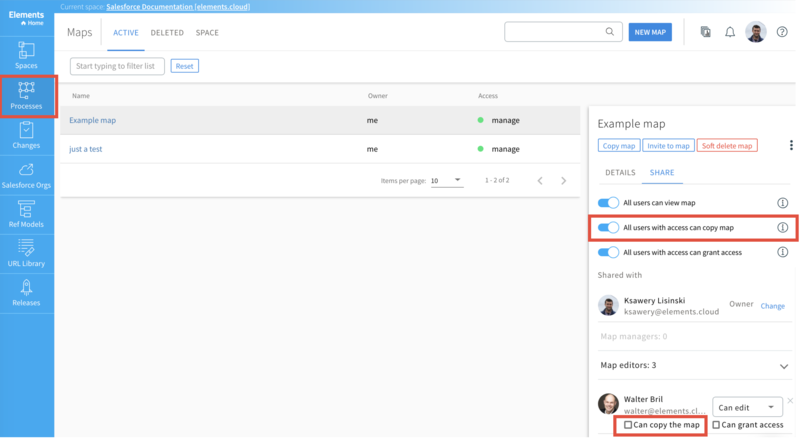 On a PRO Space, a map owner or manager can restrict copying of the map for all users and grant copy rights at individual level in the SHARE panel. You cannot move a map – only copy it. So, to "move maps" between Spaces, you have to copy a map to a Space and delete it in the original Space. To copy a map, select the map to copy from the maps page, and click on the Copy map button in the right panel. Enter the name of the map and the destination Space for the copy. If the map has a current version you can choose whether to create a new draft based on the draft version of the map or the current version of the map. While the copying takes place, you can continue working on the original map and do not have to ensure that everyone is logged out of the map. If you delete the source map, delete levels of diagrams, or modify the source map while copying is still in progress, the copy is cancelled. When a map is copied, it includes the resources, attachments (notes, links and data tables, but not the data within the data tables). The map also includes a "digital fingerprint" which records the first author and details of the originating team. The copied map will be shown as “copying” under the access column with a red dot, and you can modify access/sharing properties while the copying is progressing. When completed, a notification appears on the screen and a record is shown on the “notifications” bell icon (top-right of screen). Resources and data tables are copied into the chosen Space if they do not already exist. Data tables are related by underlying ID and name. If anything is changed, then the relationship between the source data table and the target one is broken and the data table will be copied into the library as datatable name_copyn. 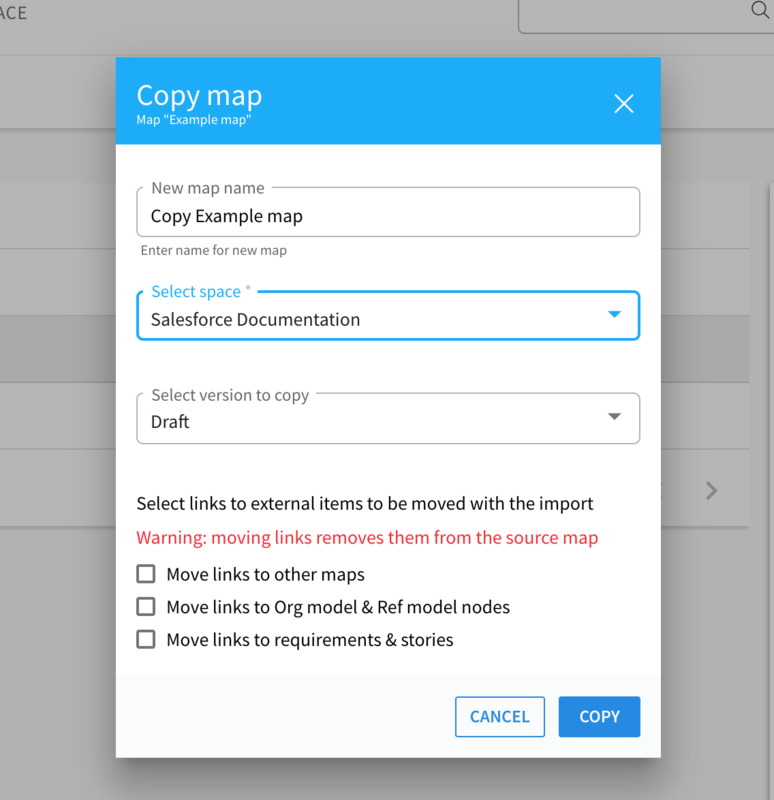 When you copy a map across a space you cannot copy over links to external items like Ref model nodes, Salesforce Org Model nodes, requirements or stories. 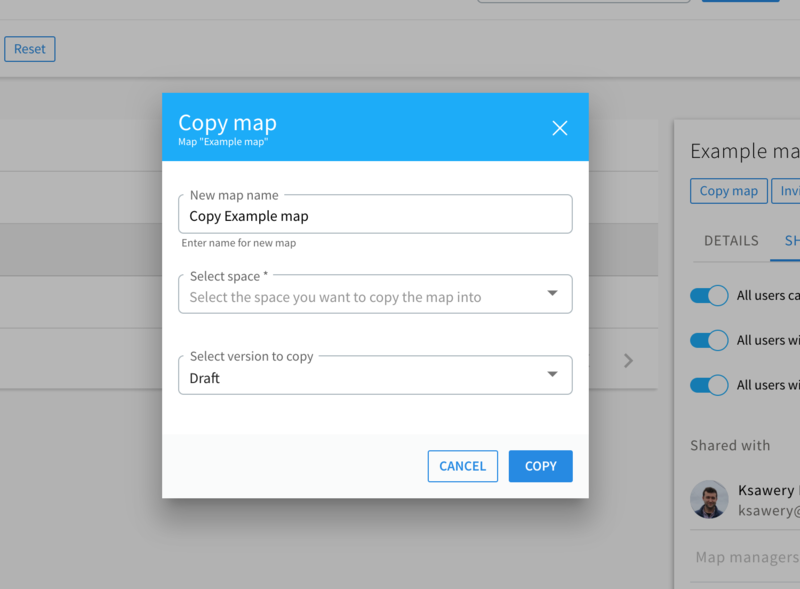 If, however, you copy a map within a space AND you choose to copy the draft version of the map then you can choose to move links to these external items to the new map.